Add turkey, garlic, oregano, basil, 1/4 cup ketchup, salt (optional) and ground black pepper. Mix well. 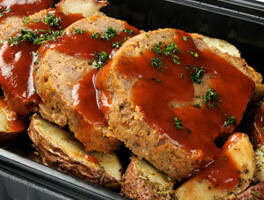 While meatloaf is baking, whisk together remaining 1/4 cup of ketchup, balsamic vinegar and hot sauce (optional).